Sutton Spring is a cottage-style holiday house with a rustic vibe, close to the centre of Daylesford and the Wombat state forest, to explore to your hearts content. Perfect for large groups, Sutton Springs offers three styles of accommodation that can be booked as a whole for a special function. Make sure you visit the best antique store in the area, the Mill Market, which just happens to be adjacent to Sutton Spring! Sutton Spring is an eclectic series of cottages in the heart of Daylesford, Victoria. With the perks of the forest, and the hustle and bustle of this trendy town, you will be grateful to unwind in these self-contained cottages are just what you need. Perfect for large groups or families, Sutton Spring offers interconnecting cottages that can cater for large groups. 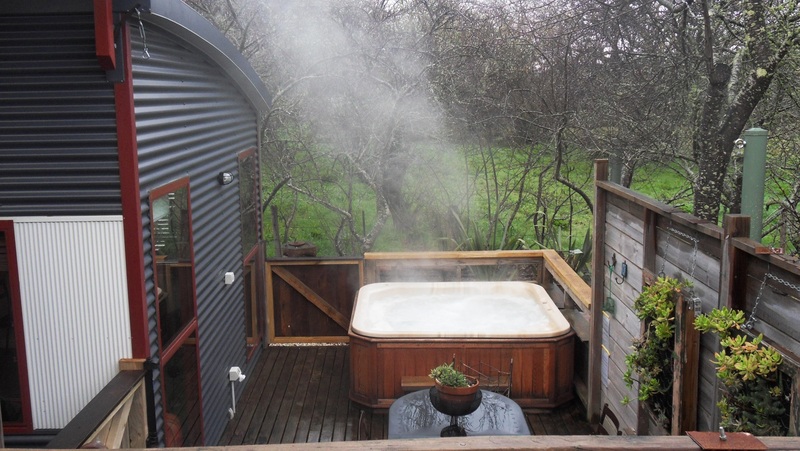 Whether you’re spending time in the outdoor hot tubs, window-shopping at nearby Vincent Street, or exploring the Wombat state forest, your stay will be full of activity. Your stay at Sutton Spring will be picturesque, surrounded by nature. Stepping out into the forest is a postcard waiting to happen, and a holiday waiting to be booked! Guests receive a credit upon cancellation which may be used at any time within a year of the original booking. To-die-for views take centre stage on the sprawling open and covered timber decks above a large private dam teeming with birdlife, where you can rejuvenate your mind, body and soul in your own private outside bath in a spectacular elevated position with expansive sweeping views over the valley adjacent to a large lush private garden and alfresco dining area containing sculptural works. Relax with a glass of local wine after preparing dinner using the kitchen equipped with a full range of modern appliances. The owners have evolved Salt Spring to be one of the leading group accommodations in the area. It is exceptionally well appointed to provide a place for groups to relax, refresh and reconnect. Salt Spring is on the leading edge of �cosy chic� with bespoke architecture, sculptural and artisan finishes. It is a split level dwelling cascading down a hillside complemented by flourishes of sculptural metalwork and artisan finishes. Salt Spring has a full bathroom with a shower and full bath. There is a separate TV/sprawl room with sliding doors opening onto another adjoining deck with a garden overlooking a dam teeming with bird and aquatic life. Salt Spring has a large flat screen TV, DVD player and an IPOD/IPhone docking station. Salt Spring is a short 10 minute walk to the shopping, galleries and restaurants on Vincent St, and is also a short walk to the lake precinct; it is adjacent to the famous Mill Market and is on the trail head of the great dividing trail and the natural delights of the Wombat Forest. 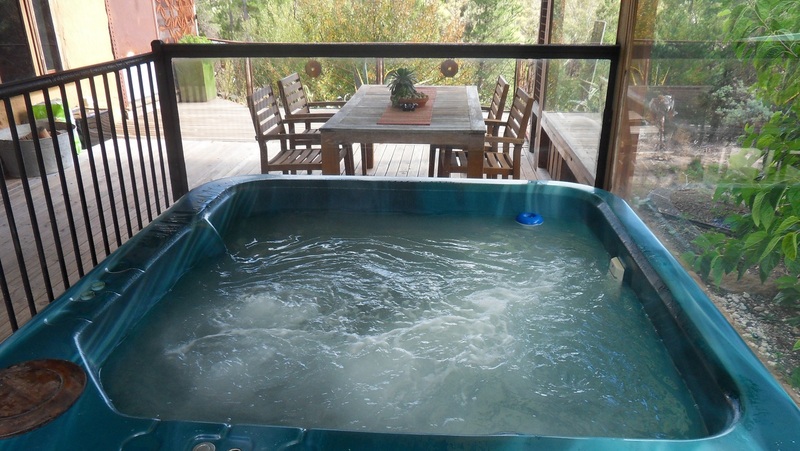 Take centre stage in your own private outdoor hot tub in a spectacular elevated position with expansive sweeping views over the valley adjacent to a large lush private garden. Relax by the glass fronted slow-combustion heater with a glass of local wine after preparing dinner using the kitchen equipped with a full range of modern appliances. Saturna is on the leading edge of �cosy chic� with bespoke architecture, sculptural and artisan finishes. A handmade metal spiral stair rises through to the cathedral ceiling to the mezzanine level where the large light filled loft bedroom space has Baltic pine floor boards and comfortably contains a queen size bed. 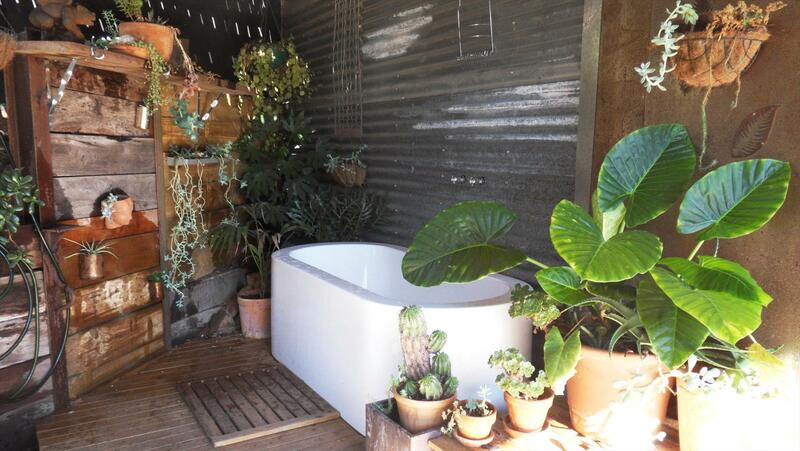 Saturna has a full bathroom with a shower and half bath. There is a separate 2nd bedroom with a double bed. French doors open from it onto another private deck with garden. Saturna has a large flat screen TV in the 2nd bedroom and another ceiling mounted TV upstairs in the main bedroom. There is also a DVD player and an IPOD/IPhone docking station. Saturna is a short 10 minute walk to the shopping, galleries and restaurants on Vincent St, and is also a short walk to the lake precinct, it is adjacent to the famous Mill Market and is on the trail head of the great dividing trail and the natural delights of the Wombat Forest. Texada is exceptionally well appointed with a king size bed , heating, galley kitchen with hotplates, small convection oven, microwave, plunger coffee equipment, full crockery,glassware,cutlery and cookware. The living area has a large flat screen hd tv with dvd and there is an ipod docking station for your convenience. Watch the native birdlife swoop through the trees as you relax in the heated outdoor hot tub on your deck within a private garden. Enjoy the star show ! The great dividing trail passes by the doorstep leading to many kilometres of beautiful bush walking with easy access to the mineral springs and lake precinct. It is an easy 10 minute walk to the centre of town giving Texada easy access to the pampering, shops and galleries of Daylesford.